I’m just going to come right out and say it. I really really really dislike drinking water. It just tastes of…nothing. Plus the more you drink the more you pee, I mean talk about making things even harder! Still, there’s no denying how crucial water is for our bodies and since I’m now in my mid-20’s I’ve really got to start listening to my body. A few weeks back, (or what seems like forever ago!) I was having the time of my life in Turkey. The sun was out and it was HOT. This inevitably meant that I was thirsty and drank a ton of water. By the end of my 10 days there I saw a huge improvement in my complexion, my skin looked brighter and even my dark circles looked like they had improved. I get that the sun and the change in my diet would’ve helped too but I was still eating my junk and the only real difference I could think of was the amount of water I was drinking. Since being back, I’ve had a few breakouts and I’ve decided that I really need to make a change. So I’m going to force (and trick) myself into drinking an acceptable amount of water every single day. 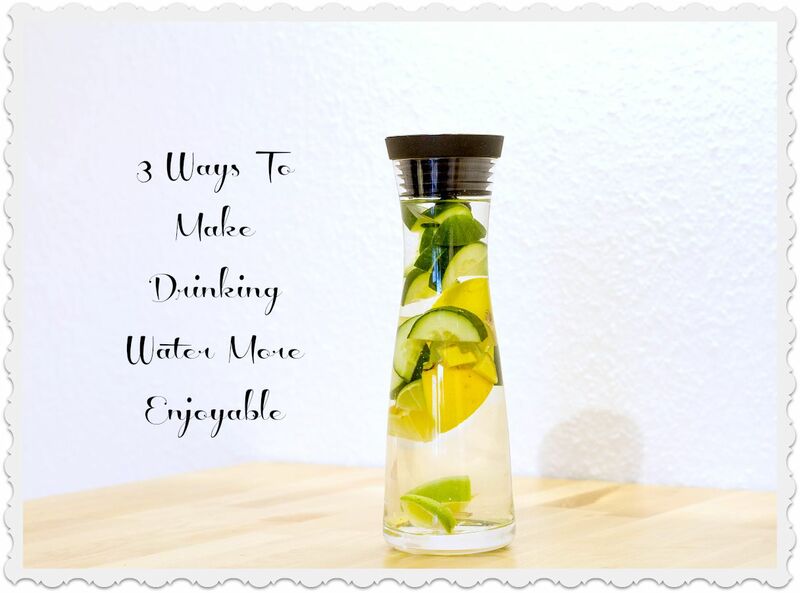 In my attempt to do so, I’ve found 3 ways that just might help you to make water drinking that much more enjoyable! 1. Buy a fancy glass/cup – No seriously, it works. When mason jars were all the rage this summer, I was so excited to use it that I made smoothies, milkshakes and mocktails just so that I could use it. 2. Add some lemon – I’m a huge fan of lemon flavoured things, I will always opt for a lemonade, 7up or mojito over anything berry flavoured. Adding a slice of lemon is supposed to be brilliant for detox purposes too and sometimes it’s nice to taste a little flavour. Infusing water with other fruits and vegetables was also a huge “trend” this summer. I’ve not tried it personally but might just try experimenting with my fruit bowl very soon. 3. Ice cubes – This one’s a little harder in winter but I find that drinking cold water is a lot easier than drinking warm water. I get that warm water is much better for you but it makes me heave, so instead I’ve invested in super cute ice cube trays to make me even more excited to drink. So far, sticking to these three things has really helped and I’m hoping to continue cutting out the fizzy drinks completely and sticking to water. Challenge accepted! Do you have any handy tips or trick that will help me to drink more water?